Jeff Bezos is coming for your wardrobe. Having conquered everything from books to loo roll, the Amazon founder’s next target is fashion. Or, more accurately, apparel. It is already America’s second-biggest clothes retailer, although a quick trawl through its digital racks will reveal little anyone might consider ‘stylish’. But then, America’s current clothing king is WalMart, not a brand known for its Juergen Teller-shot campaigns. That’s because like Amazon, it knows scale doesn’t come through exclusivity; it comes from selling cheap pants, shirts and shoes to people who don’t really care about trends. There’s a lot of money to be made from folks who pick up their tees with their binbags. Amazon is not, however, a company content to leave money on the table. And the fashion industry is a big beast from which it intends to take its cut. Efforts to encourage luxury brands onto Amazon have mostly failed – the buy-your-cat-litter-here design and propensity for price cutting is anathema to designer labels, although groups like LVMH do sell brands like Kenzo, Givenchy and Marc Jacobs through Amazon-owned Shopbop and East Dane. While browsing clothes on Amazon can feel like you’re lost in the world’s biggest closing-down sale, that’s not to say there aren’t desirable brands hidden in the labyrinth. Gant and Lacoste are two labels with bespoke ‘stores’ on the platform, while menswear essentials from the likes of Converse, Levi’s, Calvin Klein and Tommy Hilfiger are a couple of finger-taps away, often at cheaper prices than you’ll find elsewhere. Now the retailer is bringing its technological expertise to your wardrobe. Amazon’s new camera, the Echo Look (currently only available in the US), can scan you and offer boring, not-very-accurate style advice. Bezos has also acquired a body-scanning start-up, suggesting that you’ll soon be able to buy AI-suggested outfits based on your body shape. Until then, it’s also launched Prime Wardrobe, a clothes-in-a-box service in the vein of StitchFix, which couples human stylists and algorithms to predict what you’ll like. Who needs a mirror when you’ve got AI-enabled cameras? But there’s still a big gap between apparel and fashion, one that Amazon’s been predicted to bridge for six years, but which it remains the wrong side of. It doesn’t have the definable personality of a Mr Porter, ASOS or Matchesfashion, which all attract a customer who’s looking for a certain vibe. Amazon, with a design built to sell microwaves rather cashmere sweaters, is light on vibe. What it does have is product and data. Lots of both. And it’s using them to quietly muscle in on your wardrobe with private labels you wouldn’t know are it owns. Amazon’s foray into own-brand products began in 2009 with cables and batteries, products that it sold huge amounts of and which had low brand loyalty. It’s since expanded into everything from luggage to clothing, and now has almost 70 private labels, which pop up alongside well-known brands. Meraki does clean basics, Franklin Tailored offers affordable tailoring, ButtonedDown is all about business-casual shirting and there are at least three separate sportswear labels, Goodsport, Peak Velocity and Rebel Canyon. This is where Amazon could win. In the last decade it’s gone from selling phone chargers to speakers and even vitamin supplements, so don’t bet that it can’t convince men who buy Amazon shirts to invest in shearling jackets in a few years’ time. Your new favourite menswear boutique? We tasked three style insiders with spending £100 on Amazon’s menswear. This is what they chose. One area in which Amazon’s particularly strong is kit for the great outdoors. Unsurprising, since these are clothes you compare on function, not just form. Amazon’s logistics model prefers products that don’t disappear after six months. So it’s particularly good for footwear that never dates. Like the OG tennis sneaker, the Stan Smith. Amazon is like a giant warehouse – terrible for inspiration, great if you want a specific pair of Vans right now. You just need to think about your clothes in the same way you do dog food. Brands like Levi’s, French Connection and Tommy Hilfiger all sell through Amazon, so it’s always worth checking if you’re after something you already know you love. Just don’t expect to discover some new essential while you’re browsing. Amazon can’t beat Gucci’s branding, but it trumps everyone at logistics. With basics, nothing matters more than fit so it’s smart to buy a few sizes around your usual, pick the best and return the rest. Free delivery and returns (at least, if you’ve got Prime) makes for an experience that’s almost as smooth as trying stuff on in-store. 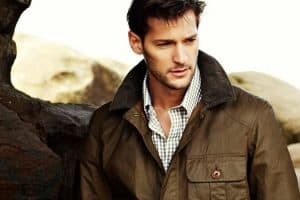 Workwear brands like Carhartt and Dickies have made fortunes through luxed-up versions of clothes men once wore to factories. On Amazon, you can find the OGs – things like hardwearing Carhartt (without the WIP suffix) chinos, or Dickies’ padded overshirts. It’s the same quality and style, but without the markup. No one discounts like Amazon, which is part of the reason big brands have been so slow to come onboard. But in an effort to make customers try its own brands, Amazon’s price-slashes – think Prime Day, Black Friday and around Christmas – are particularly deep on the clothes it makes itself. Most other brands don’t offer half off their staples, because they know they can just roll them into next season. Amazon does. So take advantage by stocking up on white tees, underwear, and anything else that your wardrobe always needs. Amazon makes some of the most cost-effective phone chargers around. Ditto for luggage, another category where it saw huge revenue and decided to boost its margin with its own products. It’s now trying the same trick with clothes. That means basics ranges that offer great bang-for-buck when it comes to fabrics and construction, even if the aesthetic won’t turn heads. So far most are still US-only, but the likes of Meraki (wear-in-any-combo staples) and Find (affordable and lightly streetwear-inspired jeans, hoodies and jackets) are worth exploring. The bookstore died because Amazon could gouge prices until no one else could compete. Bad for society as a whole, good for anyone who wants to save £2 on the new Harry Potter. The same goes for fashion – if the product you want is on there, odds are it’s cheaper than anywhere else. So while Amazon will never make you fall in love with a Cuban collar shirt, once you do so elsewhere, it’s worth price-checking quickly before you hit add to cart. Its fashion play might be new(ish), but Amazon’s been a horology hub for years. As ever, it’s not a pleasant place to browse, but if you know what you like – minimalist brands like Skagen, say, or fashion watches from the likes of Michael Kors – then you’ll be unlikely to find your favourite cheaper anywhere else. It even does a decent range of Swiss and luxury watches, topping out with a rose gold Audemars Piguet Royal Oak, for £44,098.95. Although your delivery driver will probably still stuff it behind your bin.